What's Up With Bear Grylls? If you have ever watched Man vs. Wild on the Discovery Channel, then you are probably familiar with Bear Grylls. He is a British ex-military dude and survivor expert. The first season I watched this show, I thought it was very entertaining and insightful for anyone interested in survival skills and techniques. Bear has been criticized and accused of staging parts of his TV show. I don't have any problem with that. It's obviously just a TV show teaching people how to survive in the wild so I try not to take it too seriously. It's not like I have any money riding on the authenticity of everything he does. What I do have a problem with is his willingness to do some of the most disgusting things ever. I think what he does is more for ratings and shock value than for actual survival technique. Some of the more disturbing things he has done are eating raw snakes, spiders, scorpions, squeezing the water out of elephant crap and camel dung into his mouth, climbing into a dead camel carcass, drinking his own pee, etc. It's not like he does these things reluctantly either. He can't wait to do some of them. How is he going to top himself next season? I suppose he could always institute cannibalism and eat a member of his camera crew. It's one thing to eat a giant beetle or a hairy spider and choke it down, but when he comments on the benefits of protein and vitamins and say things like "not bad", then that really bugs me (no pun intended). I wonder if Bear Grylls ever complains about his food when he goes out to eat. Can you imagine if you were a chef and you saw him come into your restaurant. You could get away with murder! This is a guy has eaten some of the most disgusting things ever so I doubt he would complain if his ranch dressing wasn't served on the side like he requested. If you ever find my dead body out in the desert, despite an abundance of scorpions I could have been feasting on, just know I decided it wasn't worth it. I consider myself a fighter and a survivor, but I have do draw the line somewhere. On second thought, drinking your pee may have some merit. I'll have to check that out and get back with you before I'm so quick to judge. Not! I don't like cold weather. I'm sure I could enjoy snowy winters if I happened to be in a nice cabin with a roaring fire and a mug of hot chocolate. I could look out the window and watch the cold weather from my comfortable vantage point and say things like "Isn't it beautiful". Unfortunately that never happens, so I hate cold weather. I feel kind of ungrateful since I complain all summer about how hot it is and then when the seasons change I gripe about the cold. Don't be surprised if you see a post next summer about how much I hate hot summers. Why can't Spring and Fall (aka the reasonable seasons) last longer? Anyway, back to my hate of cold weather-I hate it because it actually hurts my body. It makes me feel like Mr. Freeze is tazing me. 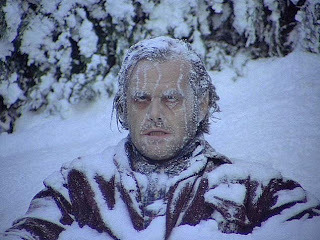 I found a fitting picture of how winter makes me feel. In addition to the physical discomfort, there is also the financial pinch of higher gas bills, but that is a post for another day. I think I am going to make a paper chain counting down the days until Spring. The other day I was thinking about some of my favorite things and the song from The Sound of Music came to mind. I've previously mentioned how I feel about musicals. I could only recall some of the words about when the dog bites and when the bee stings, so I googled the lyrics and have included them below. Warning: If you are a guy, then stop reading this post. You may feel strange and awkward if you continue reading. You will be completely emasculated if you actually sing the lyrics below. Just pretend I did a cute remake of the song that guys could be proud to sing in a deep voice. Sorry for the let down. Have a nice day. I am kind of embarrassed to admit this, but I think it's time to come out of the closet about something that most people don't approve of. I like techno music. This kind of music is also know by names like electronic, dance, trance, big beat, ambient, etc. I know it is usually monotonous, repetitious and predictable, but I still like it. Some people might say "that is so 90's or so Eastern European", but I don't care. I have always liked rock, classical, and 80's music, but I first suspected I was different when I heard the Art of Noise and liked it. I'm not into the dance club scene at all, I just prefer music without lyrics. I suppose there are some lyrics in that genre of music, but it is usually just a random phrase repeated over and over. I am still torn on this subject, because despite liking many songs I hear, if my headphones ever came out and the music I was listening to played out loud in public I would be embarrassed of it. At least I haven't encountered foul language with this type of music. Just random phrases like "The weekend starts here" or "we got a winner" repeated over and over. One advantage I have to listening to this kind of music is that if (when) I become a spy and am captured behind enemy lines and they try to wear me down and break me by forcing me to listen to techno music for days on end, I will have built up a resistance to it's mind numbing effects. I'm not really gung-ho for it or going to start any clubs, but I like it enough to feel a little guilty. Lately on Pandora I have been listening to stuff ranging from Moby, Infected Mushroom, Propellerheads, Fat Boy Slim, The Crystal Method, Juno Reactor, etc. Writing about this topic brought back some memories to an old Home Star Runner segment which I have attached. 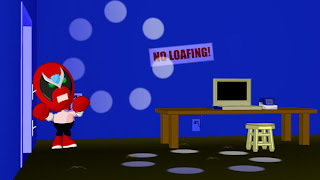 I'm afraid I can't hold a candle to Strong Bad's interpretation of techno music. http://www.youtube.com/watch?v=JwZwkk7q25I . I strongly suggest you click on the link. Several years ago a friend told me the following story. He said his sister who lives out of state called him up one Sunday afternoon to tell him about an experience she had at her church. She said they were having a special service where their church members were able to come out of the congregation and speak from the pulpit to share a thought, their testimony, or express gratitude. One woman got up and mentioned how grateful she was that her husband was feeling better. 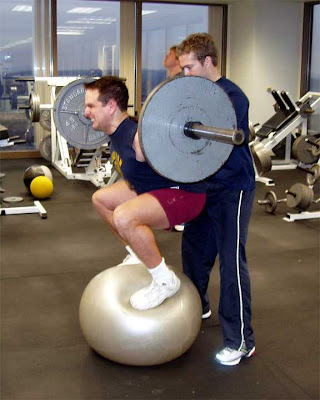 She said he had injured his scrotum several weeks before and as a result, he had to take it easy and could not do all the things he used to be able to do. She said it was hard on their family but she was grateful he was finally getting better. She went on with some other thoughts and finished while the entire congregation silently sat wide eyed and shocked. She then sat down and her husband immediately ran up to the pulpit and made a one word correction into the microphone. STERNUM! I will forgo the usual picture for this post. I think my blog may have lost it's PG rating for a day, but that story is too funny to not share. As you know from my recent post about cell phones, I have been in the market for a new phone for quite a while. I have always been technologically challenged and have never even initiated a text message before. I finally got with the times and upgraded to a Motorola Droid phone from Verizon. It took some getting used to, but I have been amazed with the phone and I love it. I finally have everything I need on one device. A phone, camera, video recorder, Internet, e-mail, texting, GPS, google maps, MP3 player, voice recognition, movies, etc. There are also thousands of additional free applications that can be downloaded onto it. I think the final thing that pushed me to make the purchase was seeing several AT&T commercials featuring Luke Wilson bad mouthing Verizon. I always hate to see companies bash each other. I wish PC/Apple, Coke/Pepsi, Ford/Chevy and all the other rivals could just get along. Maybe instead of all the commercials, they could just have a cage match with the CEO of each company to settle things once and for all. I'm really happy with my phone, but I'm a little worried because I find myself constantly engrossed with it. I feel like I'm turning into a socially backwards teenager, because I am now frequently typing messages, looking stuff up, or listening to music with my headphones while I'm around other people. At least I haven't gotten distracted by playing video games on it yet. Famous actors have it good. If their career slows down and they don't feel like making movies or getting involved in a TV series, they can always turn to commercials. Many actors have endorsed products over the years, but some are more memorable than others. Here are some that come to mind. If I could endorse a product it would be Toblerone chocolate. I'd end each commercial by raising my eyebrows and smiling as I snapped off a triangle of chocolate and popped it in my mouth. Maybe if the good people at Toblerone>Kraft>Phillip Morris would finally get with it and realize that I have been promoting their product and doing free subliminal advertising for them on my blog for years, then they might finally give me some free goods. If they don't get their act together soon, I may just have to drop my unofficial sponsorship of them and start promoting Sweets chocolate covered orange sticks in an effort to make them jealous. The recent Tiger Woods news and his subsequent loss of endorsements should have given them a wake up call. It works both ways! I'm afraid I may have to make a couple movies first and get famous before they listen to me. Sometimes getting free candy is harder than it seems. I hate change. I usually fight and kick to stay with what I'm comfortable with. It drives me crazy when Hotmail, Facebook, or something else you are familiar with changes their format. I think most people can relate to this. I'm embarrassed to admit this, but I still don't know what Blue Ray is and I don't even understand Twitter either. I think it's just really short blog posts or updates on your phone. I'm not sure, but the phrase "tweeting" sure sounds dumb. I still don't have TV reception since last year because I haven't gotten around to installing my new HD receiver. I'm still hoping all the broadcasting stations will switch back to regular rabbit ears when they find out that I've been inconvenienced by the HD upgrade and would prefer not to change. I have a feeling that there will be some major changes coming up soon. I'm no Nostradamus, but it's obvious that change is inevitable. Since change is going to happen, I might as well to learn to accept it. I sometimes feel a little like those people who used to cling to their typewriters, rotary phones, or VHS players despite improved technology. I think the people who will make a killing in the new economy (also know as the crappy economy) will be those who are flexible and can quickly adapt to changing business models. Some people will actually thrive under tough circumstances if they have the right attitude. 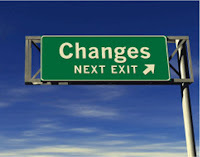 Those who embrace change can move ahead and benefit from the very changes they fear. I'd like to be one of them. I will try to get with the times this year and improve my abilities to adapt in a changing world. PS-While my need to accept technological changes is a no brainer, there are still many political, philosophical, and moral, changes and movements I am not a big fan of and don't plan on embracing, just because everyone else is doing it.